I know this is a really stupid question, but I'm new at this and trying to fix my car. I have a red wire that is running from my battery to my trunk, and it's just sitting there exposed. I just it with my multimeter, and it does have voltage when the car is on and running (something like 13V?). I'm pretty sure that this is not good, but can someone explain what this is doing exactly? Does it draw power away from the car? Can I just remove it? I don't have an amp or a subwoofer, but I think the car that I bought had one that was either stolen and they ripped all the wires, or removed, but all the wires were left behind. The guy just told me that the radio didn't work and there were some weird electrical issues. Here's a picture of it. The red wire that's hooked up to the battery looks really corroded, and the nut doesn't look like i can take it off. Is that where I would take it off? Help? I'm scared I'm going to touch the wrong wire and get electrocuted or break something. It is 12V so you will not get shocked. Disconnect the negative first. That way you will not have a completed circuit and you an work on removing the connection to the positive. 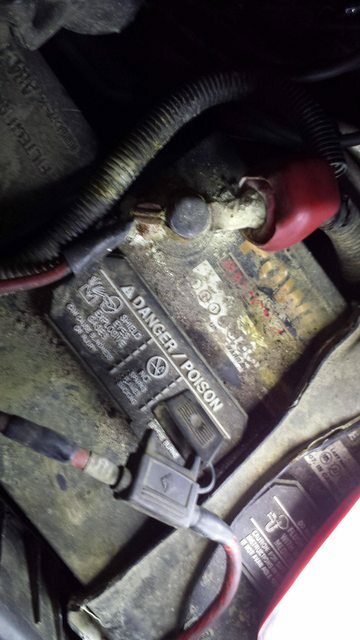 JUST MAKE SURE YOU HAVE YOUR RADIO CODE before you disconnect the battery. If you do not have an amp then that wire is pointless. I would have it completely removed by someone who is experienced. If you want to do it yourself. You must first disconnect the negative (black) wire from your battery. Then disconnect the positive (red) wire. Disconnect the red wire (that leads to your trunk - which is bridged to positive red wire). Once all those steps are performed you must disassemble the interior of your car where the wire runs under. YOU CAN NOT JUST PULL ON THE WIRE TO TAKE IT OUT. You could damage your car and if installed properly the red wire may be wire tired to parts of the interior. Once the interior is disassembled remove the red wire and reassemble the interior. Lastly, reconnect the positive (red) wire to the battery then reconnect the negative (black) wire. or you can just remove the fuse from the holder pictured. that will safely leave the wire disconnected. then cut it flush and tape up the end, then coil and zip tie it out of the way. i wouldn't remove the wire. yes, those terminals are bad. get a cleaner and wire brush and clean them well. Quick Reply: Amp wire hooked to battery, goes to trunk, not plugged in, has voltage - Help? ?